"This type of rustic dessert is called a buckle because the fruit sinks into the buttery batter as it bakes and 'buckles' the surface with its juicy weight. I was going to tell you to use any berry you want, but I changed my mind. This really needs to be done with blackberries. I added a handful of almond meal, since I had it around, and I think almonds and blackberries have a thing for one another." Stir blackberries, 2 tablespoons sugar, and vanilla extract together in a bowl; let rest, 15 to 20 minutes. Whisk flour, 3/4 cup sugar, almond meal, baking powder, salt, and cinnamon together in a bowl. Stir milk into flour mixture until batter is just combined. Melt 6 tablespoons butter in a skillet over medium-high heat; pour into the bottom of a 8x12-inch baking dish. Pour batter over melted butter into the baking dish, using a spatula to gently distribute batter without mixing it into the butter, leaving a 1-inch butter border around the sides of the dish. 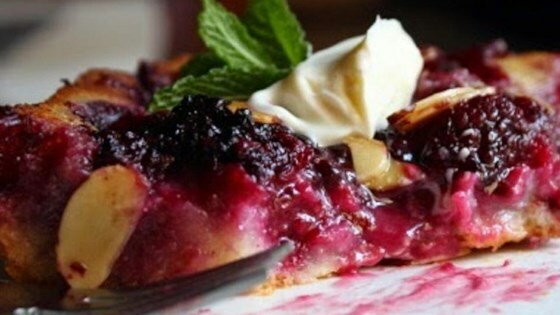 Scatter blackberries over the batter and spoon any accumulated blackberry juices over the top. Bake buckle in the preheated oven until crisped and browned around the edges, about 1 hour. Melt remaining butter in a small skillet over medium-high heat. Cook and stir almonds in hot butter until golden brown and toasted, 2 to 3 minutes. Sprinkle toasted almonds over blackberry buckle and cool buckle to room temperature. I made this with no changes. My daughter said "you're the second best chef in the world" who's the first? "Chef john. Thanks so much. Keep these coming, my family loves them. This came out very dry. Absolutely fantastic, my new favorite blackberry dish. No changes required. Simple and easy, Thanks for submitting! Tastes great, unfortunately for my diet. Even my berry-hating spouse likes it. Chef John is the gold standard of recipe mavens. I had to take out of oven after about 45 minutes because it was getting real brown on top. I served it warm with vanilla ice cream and it was very good.